This villa is situated on the 11th Fairway of the championship links style golf course this stylishly finished home has so much to offer you and yours. Look out for the resident herd of Springbok whose silhouettes at dusk are a true reflection of this great country. Just a mere 5 mins to Melkbos beach, Big Bay Waterfront and many sumptuous restaurants to choose from in and around the area. 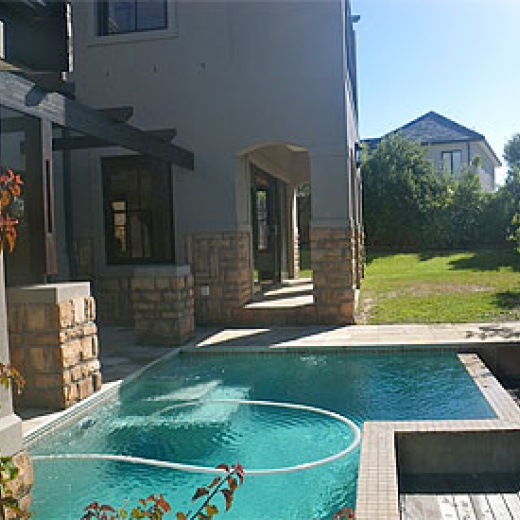 Luxurious 4 bedroom, 2.5 bathroom villa on the very beautiful, tranquil and secure Atlantic Beach Golf Estate on the West Coast of the world renowned Western Cape. Spectacular views of Table Mountain coupled with privacy and comfort promise you the best experience in this beautiful part of the world. Family holidays, golfing getaways and corporate executives alike. The villa has 2 queen size bedrooms, 1 twin and 1 en-suite king size bedroom with its own fireplace and lounge area overlooking the 11th fairway. All the bedrooms are on the second floor. The main floor consists of a formal lounge and dining room that easy seats 10 and these 2 rooms are divided by a two way fireplace, open plan fully equipped kitchen and family/TV lounge with Satellite TV, DVD & Stereo leading out to the very interactive outdoor entertainment and barbeque (braai) area with swimming pool surrounded by a lovely garden. The main floor also has an indoor BBQ area leading out to the outdoor entertainment area. Double garage with access directly into the house. There is a separate cottage that has a queen size room with full bathroom and lounge area with own fireplace should additional room be needed.